The Spotter Webcam is the latest addition to the Cyber Snipa family of hi-tech, cutting edge webcams. It looks like a giant telescope, and it kind of is. Sporting a detachable 7 to 18 times zoom lens, the Spotter is ideal for a variety of uses, including personal security, chatting on the net, multimedia presentations and web broadcasts such as Skype. Which potentially technically possible, it is not for spying on your neighbors. 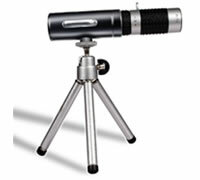 Mounted on a sturdy adjustable tripod, the Spotter Webcam can be placed anywhere in the room for accurate and stable broadcasting. The Spotter comes complete with Cyber Snipa webcam software, custom designed for versatility and ease of use.